I seem to be going though a slightly nostalgic phase. In part this may be due to breaking out MacDuff for some single figure off grid games and partly due to trying out Airfix's new rules which have a very old school feeling combat system with handfuls of dice and morale checks. It may pass. Recently I watched an old 1950 movie called "Tripoli" starring John Payne and Maureen O'Hara, not to be confused with the 1942 movie called "Shores of Tripoli" starring John Payne and Maureen O'Hara which is a WWII film. Tripoli is an adventure film set in 1805 involving a small party of US marines on horse back leaving Egypt with a force of mercenary Greek Arnauts (in amazingly accurate costumes) and Arabs to take the town of Derne from the rear. (As unlikely as it seems, this part was based on historical events). When the final bombardment and attack was playing, I couldn't help but think what a great scenario it would make for a MacDuff to the Frontier or The Sword & the Flame game. I even once had all the 54mm troops and scenery I would have needed, even the Greeks. OK these guys aren't actually my old Greeks but close enough. The fort and its defenders are long gone but they went to a good home. Actually the movie would have been even better as a game with separate characters with objectives etc as well as units of troops, perhaps Gaslight or something similar. It won't happen here though, despite numerous efforts, I just can't seem to "get into" semi-roleplaying games with characters and story lines. I can just manage if its a group game run by someone else but certainly not solo, I get bored to distraction and self-conscious at the same time. In fact my lack of both imagination and playfulness is downright shocking at times, at least as shocking as my lack of seriousness! Luckily I'm OK with just being me. However, since modernized nostalgia or "the way it should have been" is still active, I have been poking about at my boxes of 54's for the Cyprus Hills campaign, thinking about the latest edition of "With MacDuff" and musing. On Thursday Ron & I, armed with a more complete idea of the rules after some correspondence, had another go at Airfix battles. There were numerous small things that we had gotten wrong but the big one was that we hadn't realised that in addition to playing interrupts, players alternated playing action cards. This gave the game a much more interactive feel. We had also discovered the Valour token which allows a player to reroll a die or set of dice at the cost of passing the token to the enemy. Its a small thing and rerolls can fail as badly as an original roll but somehow failing once is bad luck, failing twice is fate or the powers that be laughing at you. In any event it was fun and it did had a dramatic effect at a key moment as we shall see. Contact! The opposing forces are now free to manoeuvre off road. To refresh our memories cards are laid by the unit that carried them out until the clean up phase. Ron was a busy man during the intervening week and he redeployed the US and German infantry from 2 man stands to washers. Amazingly 10 of the chunky Plastic Soldier Company figures will fit in a Hexon hex. Just. 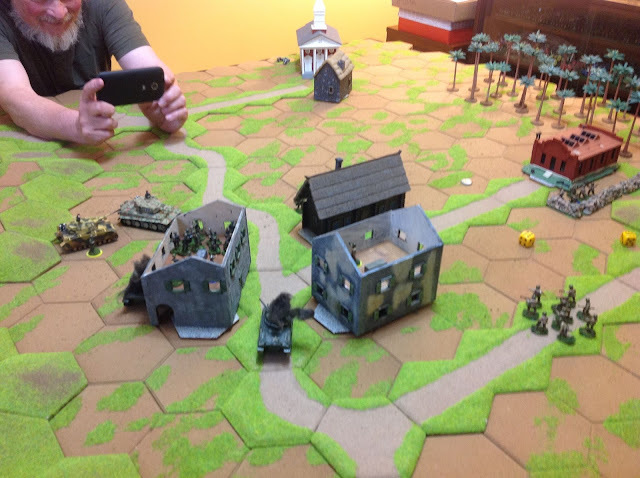 The table was still set for Sawmill Village so we diced for sides and Ron got the Americans. The premise is a clash between advance guards and both sides must move down the road at full speed until the enemy is spotted. At that point the objective becomes controlling the village crossroad. 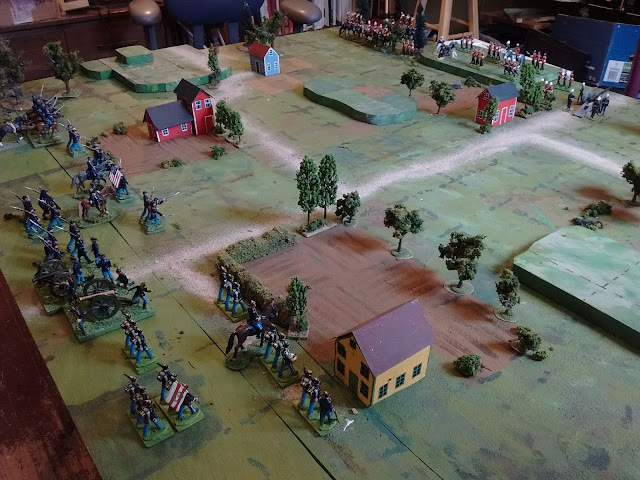 Given the layout of the twisty road on Ron's board and the rules, The Americans (or whichever player is on that side) are a shoo in to get to the town first but the other player's main body has a shorter cross country march once the enemy is engaged so it is still well balanced. We used slightly larger forces this time, in fact all the forces from the first two scenarios. This gave us each 1 captain with a unit of veterans, 4 infantry units with a Leiutenant, and 2 (German) or 3 (American) tanks incuding a Lieutenant. We each had a hand capacity of 7 cards and a draw capability of 5 cards. It paid to try and save up to a full hand and try to hang on to 2 at the end of each turn to maintain maximum flexibility. Of course, sometimes there was a moment of desperation or an opening too good to miss and a few extra interrupts would deplete one's hand requiring a pause to recover your full potential or else a risky full press if the time or situation did not allow time to catch your breath. The town is ours! or wait was that something moving in the house across the street? 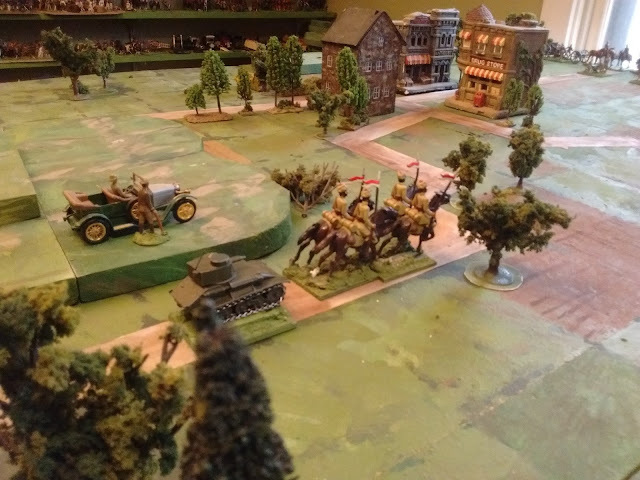 As anticipated Ron siezed the town with tanks and infantry so I began organizing an all arms attack on one end of the town, expecting him to stay under cover and bring up reinforcements. Wrong. Luckily my lead infantry survived an assault by one of his shermans and was even able to recover some of my losses thanks to one of the cards. I left his tank to my pair who had been moving forward in support and it may be seen burning smokily above. My infantry had an assault card allowing them to move through the town to open fire on his infantry which they managed to pin encouraging me to assault. At the end of a bloody to and fro I occupied the building (note 1 lone guy peeking around the corner in the photo above to remind me that his friends are inside) while the remnant of Ron's unit retreated across the street to cover and I ended up with the Valour chit. 2 Panzers vs 1 Sherman. This isn't supposed to go well for him. Things were looking up. I just had to move up my supporting infantry, manoeuvre into position to take out his wounded command Sherman and then, frig, another Sherman, OK I'll take him out first. or not. Why am I suddenly rolling so many 1's and 2's? I'll use the Valour chit, Oh boy 1 hit! Considering the combined 10 misses including the reroll, I'll take it. OK new hand, new plan, I'll let the little guy live for now and put everything on the command tank who is down to 1 hit. OK I don't have the movement to get line of sight to him from both tanks but, now what, oh he had one of those cards too, now he's up to 2 hits, Still I've got a Tiger and it can inflict.....1 hit...sigh. Luckily, if he runs I have an intercept that will let me shoot. Ha! Another Ronsen! Ok this looks good. My squad in town is down to 5 men but I've got cover and he's only rolling 5 dice for 5's and 6's and is unlikely to roll 5 hits. Ok. Well I'm not likely to fail 5 saves....Seriously? Well at least I didn't have to take a morale check. OK more units moving up, but is there time? OK he's still here and my command tank is a bit rattled but that's my infantry about to dive into cover behind his flank and he's lucky its the end of the game. HA! Got them all. The town is MIN...what? Audie Murphy? in the house with a brave private? Still alive?! NOOOOOOOOOO! So yes, he saved 2 guys then rolled boxcars on his morale! So a happy and exhausted draw after 3 hours of thinking and rolling and pushing troops around, not to mention checking notes and discussing how the rules were suppose to be played, especially given the hexes. It took us another hour to debrief, reminisce and discuss future possibilities. I'm not sure how long the actual playing time was, probably less than 2 hours, but the time flew by without us noticing. I'll definitely be ordering the rules and cards when they are available over here. The original idea behind this scenario was some variation on an attack on a fort or an ambush either of supplies or a relief column. Unfortunately, given the shape of the cloth and the placing of the painted on terrain features, the only place for the fort was near the middle of one long edge. Given the small table and the large footprint of the fort and of the units, the only scenario that would work was an assault on the fort so I removed it. The table layout then suggested converging columns bumping into each other without warning so that's what I went with. 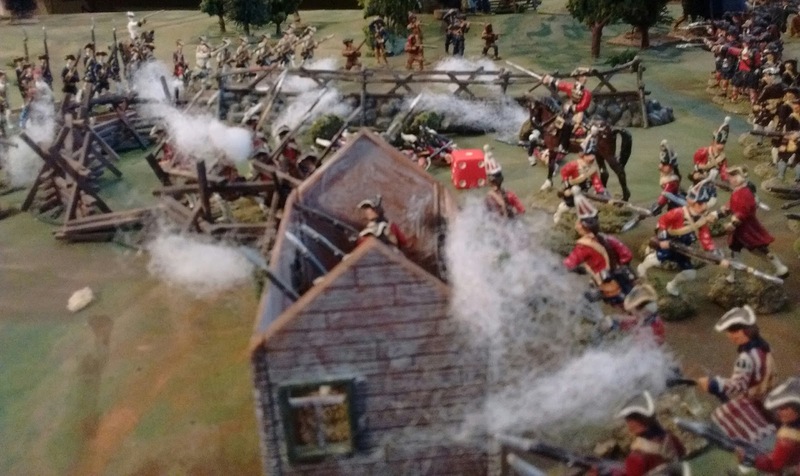 The time period for this historical fantasy setting was the ongoing low level warfare in Nova Scotia that preceded the official outbreak of war between Britain and France in 1756. Checking the units that were available without too much fudging, I decided to field 6 companies per side. The British, marching up the road from Fort Edward had the Grenadier and 2 line companies of the Royal Irish (yes I know this was 10 years before the date they say they came to America but the reason for that will be seen and yes they do look a lot like the Queen's Irish in the service of Rosmark), 2 companies of Massachusetts militia and a company of elite highlanders who have presumed the dark blue facings of a royal regiment a few years too soon. The French marching down from Beaubasin perhaps, had 2 bands of Miq'ma warriors, 1 of veteran irregulars and 1 of less enthusiastic Acadian irregulars as well as 2 Companies Franches from the garrison at Louisberg serving as line troops. The Miq'ma and Acadian irreguars are 8 man skirmisher units, the rest are 12 man line infantry. The tracks were deemed open ground rather than roads. None of the pictures of the columns marching on seem to have survived so please picture the columns snaking forward separated only by a wooded hill until they spot each other across the open field and begin to deploy. About 5 turns in. The battle lines form. On the riverside the farm is about to be contested while inland a group of Mik'ma warriors is working their way through the woods to flank the Highlanders. I started off using the original 1 unit at a time card draw system which is still an approved option but after 2 turns it just didn't feel right for this scenario so I went back to the initiative option. I added a twist though, instead of dicing, I pulled cards like I have been doing for Square Brigadier and other games for the last few months. Worked like a charm including some chance cards. 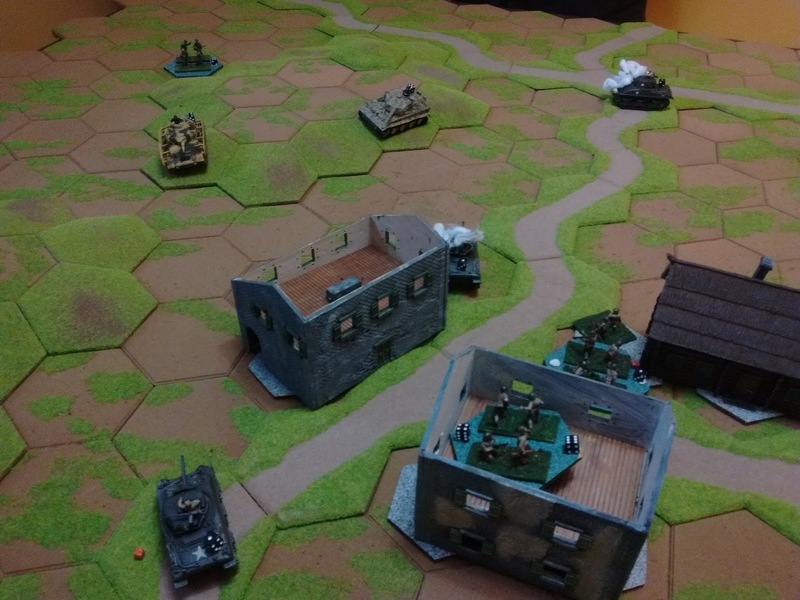 The rules allow units to fire on their turn instead of moving or to fire just before the joint melee phase so the initiative is important but not as much as in some of the other games. 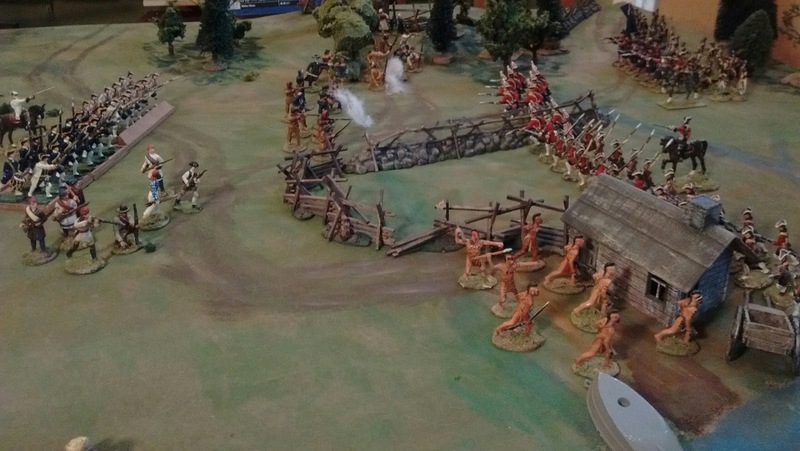 The British surge forward to claim the farm, forcing the opposing skirmishers to fall back for their own good. The grenadiers are a bit rash though and are caught by frontal volleys from the advancing French regulars and flanking fire by some Acadians. The telling blow was a handful of 5's and 6's from the brand spanking new company of PA bluejackets followed by a 1 on morale. 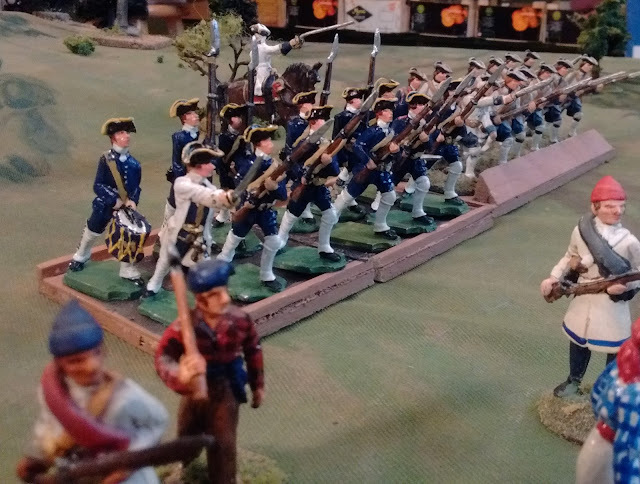 Just after the dramatic repulse of the grenadiers I made a careless error. I pulled a chance card allowing the French to force a morale check on a company of militia. They failed and retreated off table while the Grenadiers also failed (2+ to pass with the Colonel there...) and fellback, except that's not the way it works. Units either rout when they take the test or they fallback a normal move and automatically rally on the next turn. Oops. When I figured it out a few turns later I brought the militia back. 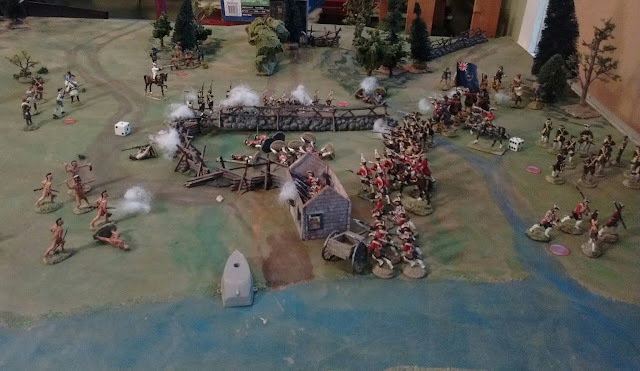 The British line has stabilized but note the warriors creeping up, firing into the flank of the Highlanders at the top of the page as well as the 4 survivors of the 2nd Irish company heading for home after being caught in another crossfire and another handful of 5's and 6's from the boys in blue. The game was full of twists and turns and drama, some of it due to extreme die rolls at key moments as well as to gambles taken. I was rather surprised at the end to find that I had spent nearly 3 hours playing the 11 turn game. It didn't feel like it. I was even more surprised at a brand new unit, the varnish barely dry, rolling high consistently through the game. I'll have to watch those lads! The tide seemed to turn again as aggressive close range musketry attacks by the New Englanders and remaining Irish sent the remaining Acadians and Mik'ma as well as the white coated regulars skittering for cover. 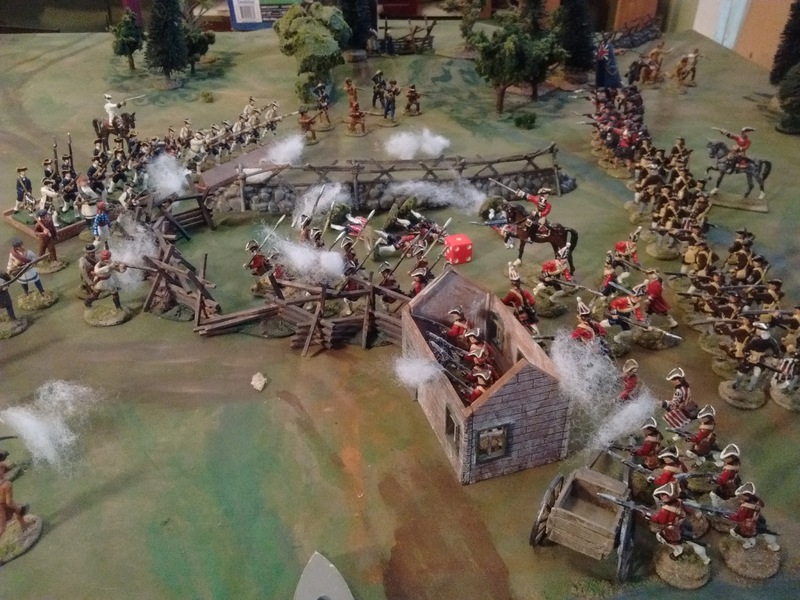 The Irish Grenadiers had launched another bayonet charge though and again ran into a wall of fire including an enfilade from the Bluecoats. The following turn the last, 1/2 strength, company of Irish and the New Englanders all took a beating and routed. 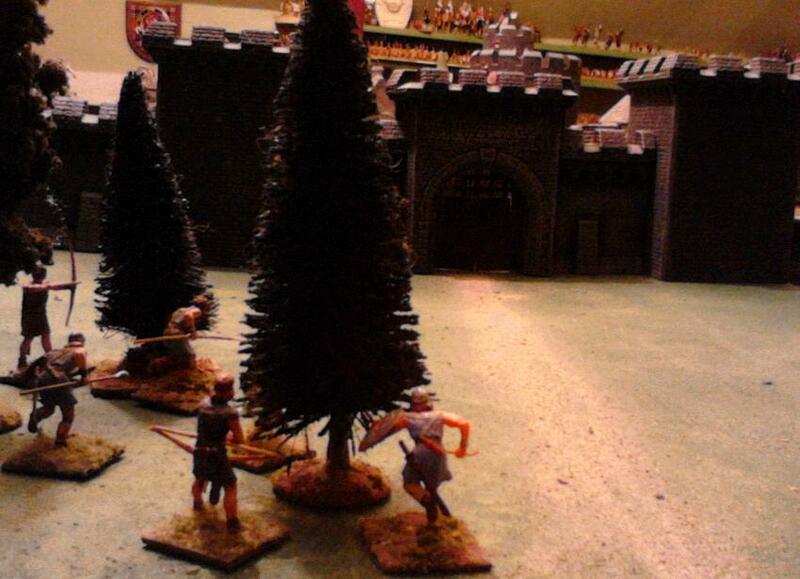 The Highlanders, fresh from having chased off the Miq'ma, swords in hand, moved up to cover the retreat. Note: No cattle were injured during the playing of this game. This morning I finished up the 12 figure company of Compagnies Franches. This is pretty much what the game felt like. I'll give a more detailed report tomorrow but apart from some wording issues on movement restrictions everything was just fine. I'm going to be quite happy to update the rules as the 20th anniversary edition of With MacDuff to the Frontier. Technically the publication anniversary is late summer next year so there is time for more testing and maybe even some proofreading. More importantly, the mix of fully round and semiflat homecast figures worked quite well for me so I won't need to upset my NQSYW world just to accommodate the new molds. The new French and British figures, once released, will go to the newly announced MacDuff in Acadia collection. At last, figures that can use my magnetic trays! If the new figures look a little blurry that's partially because the photo is but also because I didn't notice until I was priming that while most of the heads came out perfectly, a couple of them cast up without much of a nose. I had spares on hand if I'd just noticed before gluing but I wasn't going back. 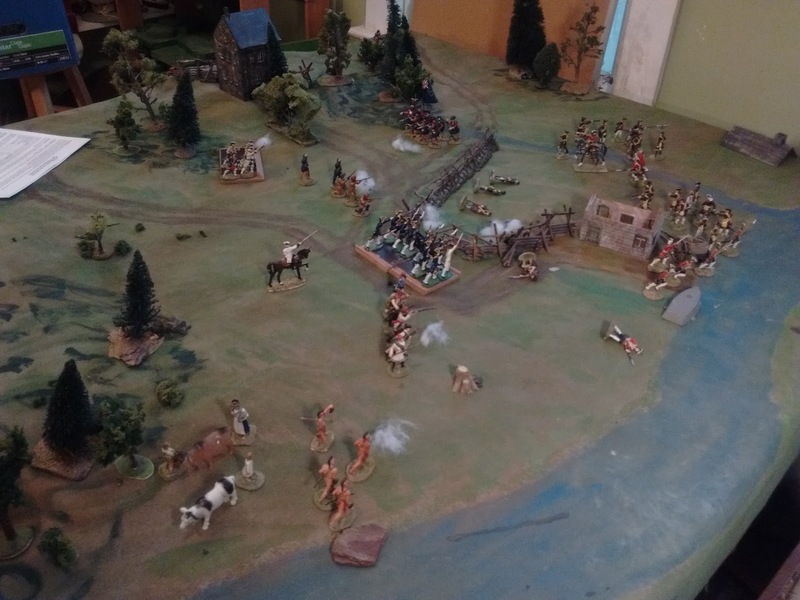 Its been a while since I did a Seven Years War in America game using 40mm figures and With MacDuff to the Frontier. Actually, it appears that the last one was before I moved from my webpage to blogging (really?) and it was actually a Pontiac Rebellion game that Rob Dean and I staged in 2008. (click here). However some of the AWI games have been very similar, like this wagon train game from June 2010. Anyway, the point is that an e-conversation with a friend about the latest version of MacDuff, which appeared as a Quick Reference sheet last June, reminded me that I had meant to give it a more thorough testing in hopes of writing a final, 20th Anniversary edition. 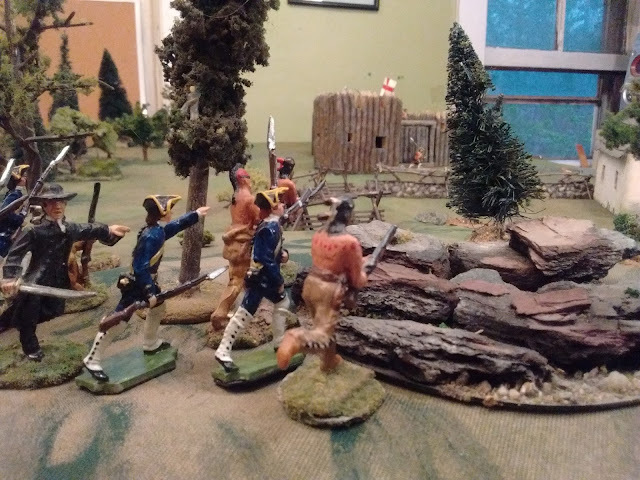 Before the turmoil of last year took my mind off it I had been thinking of either the War of 1812 or the early 19thC Atlantican Colonial wars. The only other suitable figures were my Prince August NQSYW troops but I had promised myself to only use them with Charge!. 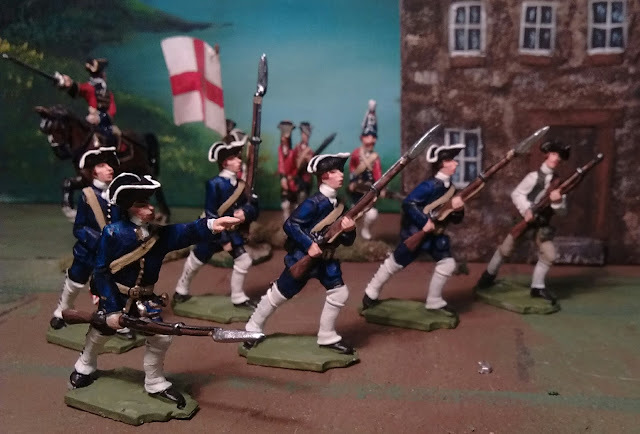 Last year I was all excited with the new PA infantry in waistcoats and started painting some up as Cie Franches de la marine only to switch them to the NQSYW project in hopes of focussing on fewer periods. That was just before circumstances led me to reduce my table size again. I can still play a small 1/2 scale NQSYW game using up to 1/2 of existing figures but that is hardly incentive to paint more. After thinking about MacDuff, about wanting a reason to paint more of the waistcoated figures, not to mention some of the imminent PA French infantry, and about what I could use the remaining handful of tall Indians and canadiens left after the great diaspora of the last 6 months, I decided it was time for a rethink. The first appearance of MacDuff in the Courier was the French & Indian War version after all. Having grown up in Montreal I have tended to associate the period with Wolfe and Quebec or with Lake Champlain and the Great Lakes. Here I am though, living in Nova Scotia since 1980. Nova Scotia where the 1740's and 1750's saw more skirmishes, raids, sieges and battles than any other part of the country did even if most were small actions. 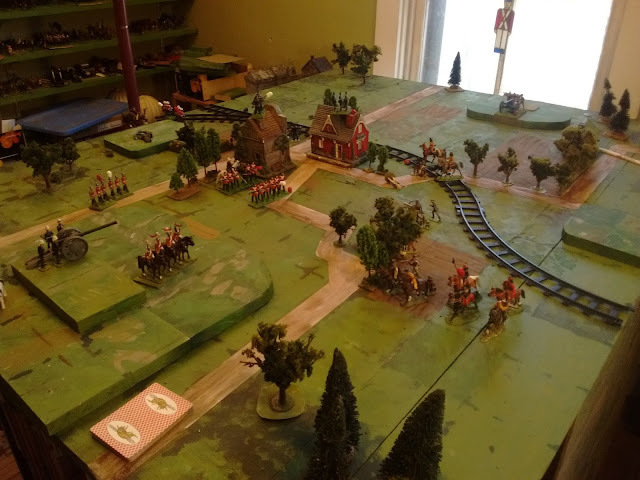 So, I spent the day casting and painting and have set the table for a traditional style MacDuff game set in Acadia using Rosmark rebels to fill in for British and Provincial troops. Look for a report on Tuesday if all goes well. When I heard that Airfix had released a boxed wargame my reaction was along the lines of "That's nice but nothing to do with me". Its not that I never play WWII. Airfix tanks and infantry featured in some of the first games I played with Featherstone's Battle With Model Soldiers back in '71. 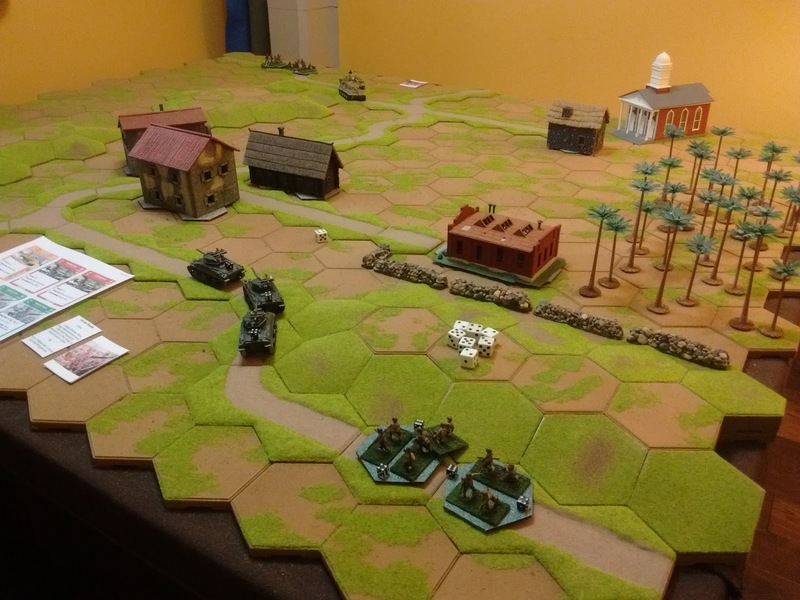 Since then I have painted and played WWII in 6mm, 10mm, 1/72nd and 54mm with various rules, commercial and home made. These days though, when I play WWII, I play with my friend Ron's toys. For the last few years we've enjoyed some games with modified Memoir but we have both felt a periodic the urge to add a bit more flavour. Along came Bob with a review of Airfix Battles and some play tests on Wargaming Miscellany and I started thinking that Ron might enjoy this and so might I. So I dropped him a note and we did some searching for other comments, reviews and battle reports and found a very useful video on the Modiphius Airfix Battles page . We decided to see if we could parse out enough of the rules to play a game to see if we liked the vibe. Getting under way. 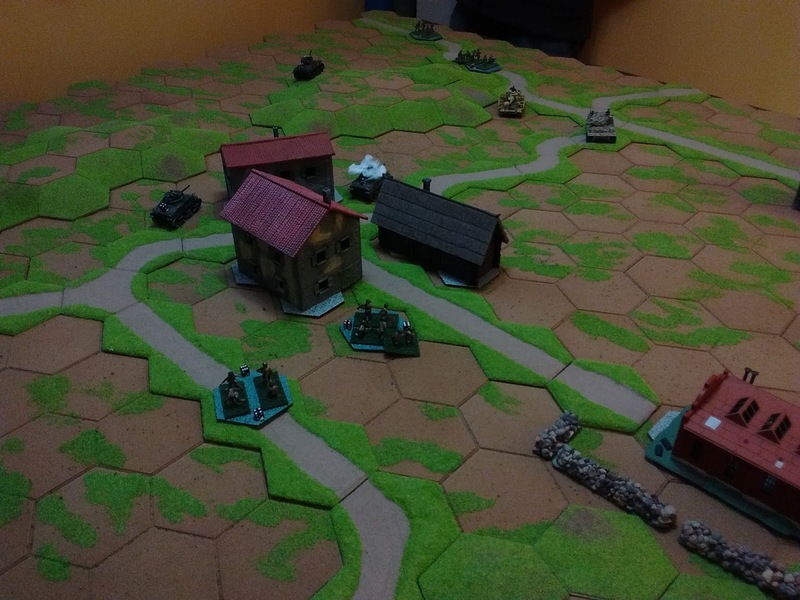 Note infantry units tacked onto hexes with 2 small dice to mark the current strength. Note also the cheat sheet with copies of unit cards to show stats. We used little markers to show pinned etc on the table. You can also see Ron's home made fudged cards for the test. They were good but real ones with a rule book to explain them will be better! Now, the game was by default going to be "our" kind of game, so, Hexon terrain, existing figures and a Grant scenario. We went with nice simple Sawmill Village and used dice to mark hits on infantry units. Industrious Ron made rule notes from the web, grabbed some basic unit card images and, having made notes on as many cards as possible, fudged a deck of cards. It goes without saying that the result was not an accurate play test of the rules as published. We didn't know what the proper mix of cards was, were missing details on many of the rules and had to adapt things like 90 degree turns onto a hex grid. Still, it worked. Luckily we are used to winging things using a "feels right/wrong" compass and the resulting game was good. It required us to think and plan to get the best of resources and to use our forces to their best advantage while minding what the enemy was capable of. There were also enough twists of fortune to get the adrenaline pumping and moment of momentary despair or triumph. It certainly didn't take long for me to discover that breaking basic tactical principles in favour of a risky gamble was, well, risky! Mind you my "Stuart born again" tank commander almost survived his ride around the enemy. It certainly cost the Germans a leader and enough infantry that by the time they pressed forward to try to take the village from it, it was too late. Saved by the clock! End of Game. 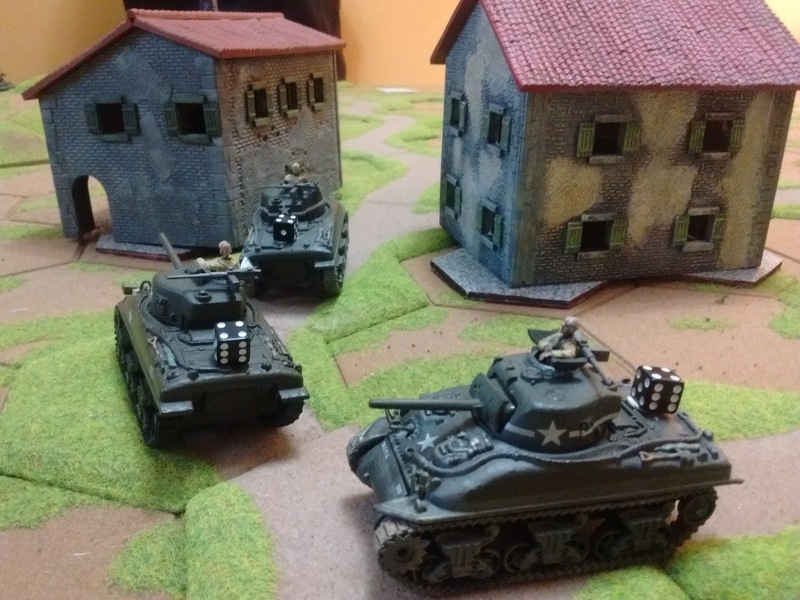 Ron's surviving infantry has pulled itself together and his tanks are shelling my infantry out of the town despite the periodic support of my last, battered Sherman. Another 2 or 3 turns and.... but wait! ... time's up! Darkness falls, reinforcements arrive or something and the Yanks still hold the crossroads. So will I buy? Yes. At this point I don't have spare cash to waste on maps and counters that I'll never use but as soon as the rules and card decks are available individually I do intend to buy. I suspect that Ron will have the boxed intro set as soon as its available over here. Will I start building my own WWII armies again? Nope. Post war Roscia and Lilliput are close enough for me and I'm quite happy to do my own unit and vehicle stats for those solo games while continuing to play with Ron's WWII toys. I was over at Ron's today. No Martians today but we were still being trendy. These aren't actually Airfix tanks. We don't actually have a copy of the rules yet, or the cards but we have the internet, ingenuity and lots of experience. We also had fun. Whatever happened during last Saturday's game has now been pretty much over-written in my memory. Even Sunday's replay using The Square Brigadier is slowly fading after some busy days of house and garden work and a wide ranging chat on other wargaming topics when a friend dropped by (watch for a Crimean era 3d printer steam traction engine to appear once assembled in a few months time). However the games did give rise to enough thoughts and issues to wrap a post around. The 2nd game early on. The 1st or Saturday game was played using the Tin Army with 16 infantry companies supported by 2 cavalry squadrons and 2 batteries against 14 infantry companies, 3 squadrons and 2 batteries. Each side had a General and 3 subordinate commanders, all artillery was treated equal for the day and all infantry had breechloaders. Each unit could take 2 hits and could shoot or move. Infantry and artillery were allowed to pass 1/2 of their hits each turn to a supporting adjacent infantry unit. Artillery and cavalry could instead cancel 1/2 their hits by retreating a full move and neither moving nor shooting next turn. Infantry deployed with a single company in a square was considered to be in skirmish order and was treated as in cover. Initially I was very pleased with the results of the game. The infantry mostly advanced as skirmishers to reduce casualties. As soon as they came within range they tended to stop and shoot. Attempts to charge across open ground in a dense formation ended in slaughter, especially against troops in fire. It became clear that victory would be hard to achieve unless one side could advance under cover until close enough to make a rush on a weakened enemy and/or could establish artillery superiority to weaken the enemy infantry. It all sounded about right for the 1880's. A repeat photo showing the start of the 1st game. My second thought was that the game, though quick with some tense moments watching the dice fall, wasn't all that interesting as a player. There was too much administrative management of hits and close supports and the position of commanders with too few generalship decisions about manoeuvre and committing the nearly non existent reserves. Units were also so vulnerable as to make me reluctant to expose them. Not unrealistic but not as much fun in game terms as I had hoped. That's when I decided to go back and try the Square Brigadier. As incredible as it seems, I don't seem to have a good copy of the real Square Brigadier, just various dead variants, so, I winged it. I pushed the stands back into the 2 stand/6 figure companies that I had been planning to use and fiddled a bit to get 8 infantry, 2 cavalry and 2 guns vs 7 infantry, 3 cavalry and 2 guns. The infantry could take 4 hits and the cavalry and guns 3. 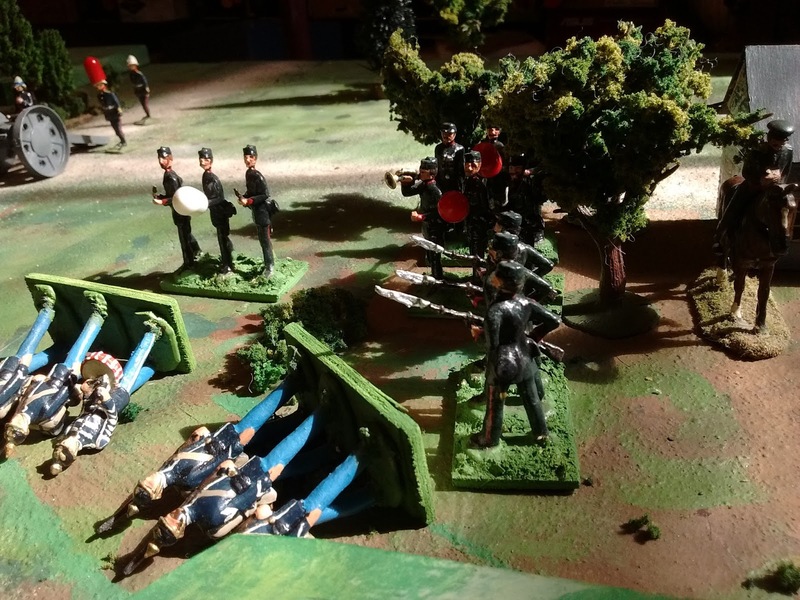 All infantry units were assumed to be deployed as skirmishers and supports when in 1 rank of figures so the increased hit capacity gave the same result without any fuss and bother. Then I turned my attention to the subordinate commanders or sacred cows. A commander for every 4 infantry or 2-3 cavalry units seemed a bit much but there was no logical way to reduce the number of commanders. I decided to postpone the debate until after the game, skip the command radius rule and drop all subordinate commanders. The result was a much better game which felt shorter than the first game but actually lasted longer despite having fewer troops. 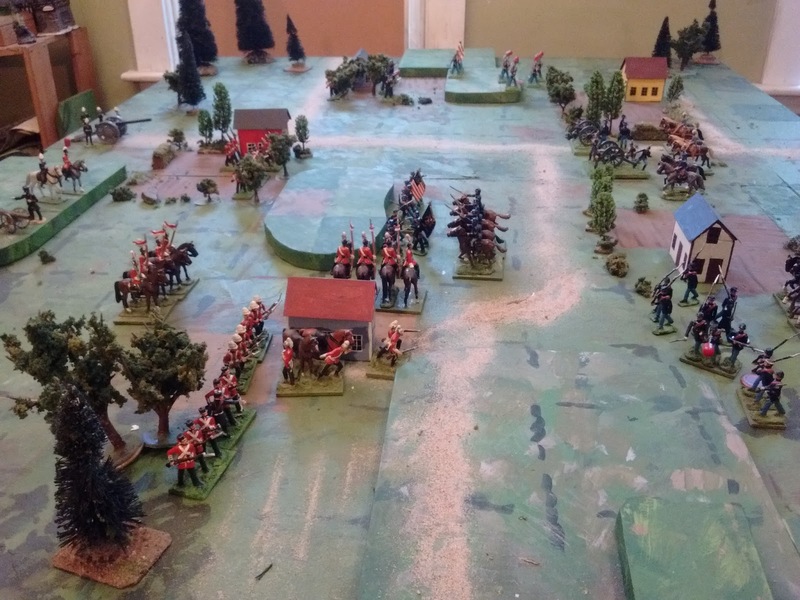 Attacking across open ground remained deadly and firefights between lines of infantry were still prolonged but there were constant decisions to be made by the player and the ability to actually change plans and commit off table reserves. Units were also more capable of surviving if caught out though occasionally a fistful of 5's and 6's showed that no one in the open was guaranteed another turn. In short it was more engaging as a game. Now I've been a fan of showing the work of subordinate commanders since at least the early 80's and despite periodic retreats from what I now see as an excessive amount of friction and subordinate incompetence I was uncomfortable without some sort of mechanism. The implicit vs explicit skirmisher and support issue was still on my brain though as was the thought that some very worthy and knowledgeable rules authors have minimized the explicit role of subordinate commanders in their games. Frank Chadwick has written some very interesting thoughts on some aspects of command rules but it was Lawford and Young in particular that keep coming to my mind. Is it possible that officers who held senior positions during combat in WWII and taught at Sandhurst really felt that intermediate officers had no role or effect on the battlefield? It seems more likely that they felt that in a fast paced game players would tend to make their own mistakes and that a system where combat results could stray far off the norm meant that sudden failures or unexpected successes might be seen as reflecting the competence of the little tin Colonels and Brigadiers as well as the quality of the soldiers. If I need something more, chance cards can provide that extra little bit of uncertainty without wasting a lot of time and effort every turn to show an extra level of detail. Not having a game role for subordinate commanders, like not showing that infantry are using supports to bolster the firing line, doesn't mean that commanders and troops aren't doing their job, merely that these things are going on without the General having to take time to do his subordinates' jobs for them. The dice and chance cards will reflect whether or not they are doing a good job. OK time to do a new clean copy of The Square Brigadier and archive it, and time to think about what to play on the weekend. Its a weekend, its raining and my wife is busy at a dogshow......Yeehaw! My original plan was to rearrange most of the furniture in my room again or at least to tidy it up. The alternate plan was to paint soldiers. Rewatching the entire 3rd Season of GofT in 24 hours wasn't part of the plan but at least it left time for a quick game. For this return to the late 19th C I reverted to minor variant on the version of The Tin Army as used in the Kapelle game last June. More in a day or so. The Spring season is always a little tricky to predict. A lot depends on the weather as good weather tends to mean that my presence is required outside, like it or not. This year there has not been (Alas and Alack!) the distraction of preparing for Huzzah or coming back with new ideas but since I already have my eye on next year and plans for a first time outing of something. There was also a troublesome non-hobby obligation to discharge but that is settled (I think) and I'm ready to proceed. On the plus side over the last 10 months I have, with help from others, carried out a big part of my clearing the decks so that the list of current scale/periods has shrunken despite a (for me) sizeable addition to my forces. The various tests and trials and the new pattern of life has also allowed me to sideline several collections for which I am not yet contemplating disposal (partly due to sentiment but mostly due to the low probability of finding a home for the figures). My collection is once again being broken into 3 parts. Lets call it Active Forces, Reserves and Pensioners. 1. The Elastolin Gambit or the Land of the Four Winds. This is my medieval/fantasy project which will absorb almost all of my 40mm Elastolins from the Romans and Huns through Prince Valiant to the late medieval and early Renaissance on my Gathering of Hosts blog. The armies need a common basing system which will be Rough Wooing 60mm x 60mm elements and many of the figures could use a freshening of paint. This occupies the same ground as the older 25mm version and I don't see much point in running both solo. The old 25's are one of the groups though that have sentimental value for me and not much for others. The units take up the same footprint as the 40's but way five times as much per stand but its always handy to have a 25mm ancient or medieval army to hand and it won't take up much space to keep 3 or 4 smallish armies just in case. I'm not sure yet how I'm going to incorporate Prince Michael. I may be able to do it using the planned multifigure bases or I may need to keep a handful of singles with magnets. 2. Not Quite The Seven Years War. I don't expect much in the way of games but one at least. More to the point, I have new molds and I want to cast and paint some more of the figures for the sake of doing so. The 1st 1/3 of a new Light Company patiently attending upon the rest. 3. Atlantica. There is still plenty of confusion in my mind over exactly where I want to take this but I want to keep moving forward. I anticipate using the grid and small units with a focus on smaller actions again and to focus very broadly on the late 19th and early 20th C periods with plenty of duplication of functionality in order to indulge in painting what appeals. This overlaps with the 54mm Cyprus Hills collection which will fall back into Reserve for now. RESERVE FORCES. These are the other active collections. They could all use some work which I don't intend to do in the next few months but do intend to do over the next few years. They are all capable of being put on the table at a moment's notice if I get the urge and one never really knows when the urge will strike. 1. Rough Wooing. 16thC English vs Franco-Scots. 3. War of 1812. The Portable or Gridded 40mm Version. PENSIONERS. These all need work which I don't intend to do in the foreseeable future. I don't plan to play with them any time soon but I could do so and might. In short I'm not yet ready to get rid of them. 1. The Ancient Ones. My remaining 25mm ancient/medieval/fantasy armies recruited primarily from Scots, English, Sassanids and Steppe tribes. 2. 1759. 30mm 1759 Quebec plus miscellaneous friends. 3. NkhuKhuland 54mm Plastic and metal Colonials. 5. Modern (sic) 1/72nd 1960's fictional. Yikes! Over a week! Well, I have been away visiting family so that's part of it but before that there were some posts and games for my Gathering of Hosts blog. It looks like a few busy, but not wargaming busy, weeks ahead but even after that it looks like the Gathering of Hosts side of things will be taking up a larger share of my hobby time for the next few months. 40mm Elastolin late Medieval/early Rennaissance Fantasy setup. A Sudden and Predictable Reversal. I'm not quite sure why I suddenly thought that I was planning a major 40mm push into the Rifled Musket era. I was certainly thinking that when I set up the last game but as I cleared the table I was reminded that most of the troops on the table had been painted for either the smoothbore musket or breech loading rifle eras. Something was off. Later yesterday evening I checked the latest post on Warfare in the Age of Steam and Steel which was a link to a marvelous collection of early combat photographs. Yes! This was exactly what I had been planning to do. No idea why I forgot. Whew. Saved in the nick of time. This had been where I was headed. So yes, on track, but for the 1880's and 1890's with "company" sized units.